Washington, D.C. (October 2, 2017) –Members of Congress have been bringing pets to work since the nation’s founding. 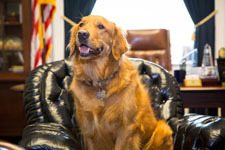 A new survey confirms that Capitol Hill remains a very pet-friendly workplace today, with a solid majority of House and Senate offices who responded to the survey saying they welcome pets at work on the Hill. Pets have had a presence in Congress from the beginning. According to the Assistant Senate Historian, Dan Holt, senators used to bring their hunting dogs into the Old Senate Chamber — to sit right by their feet during floor debates. Circa 1800, congressional rules were enacted to prohibit pets on the Chamber floors. Congressional rules, however, permit pets nearly everywhere else on Capitol Hill, and staffers are almost universally aware that pets are permitted throughout congressional buildings, with few limitations.